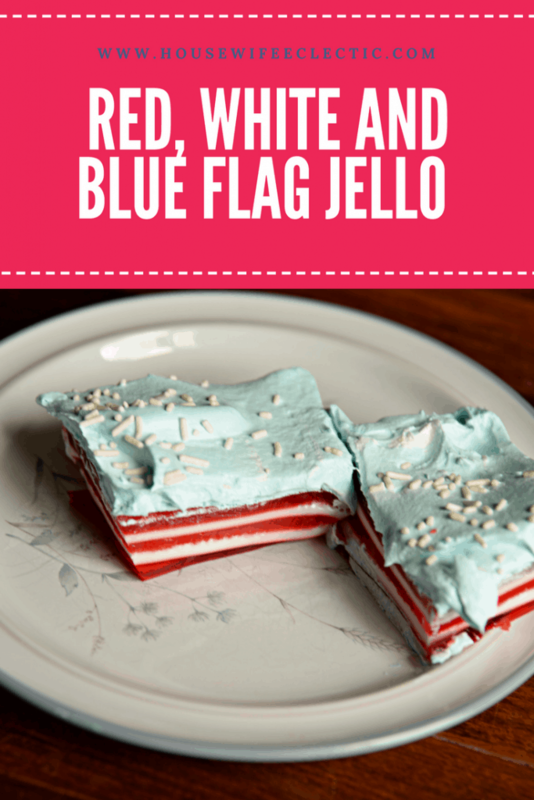 I started making this fun flag Jello a couple of years ago and it has become a fun family tradition! 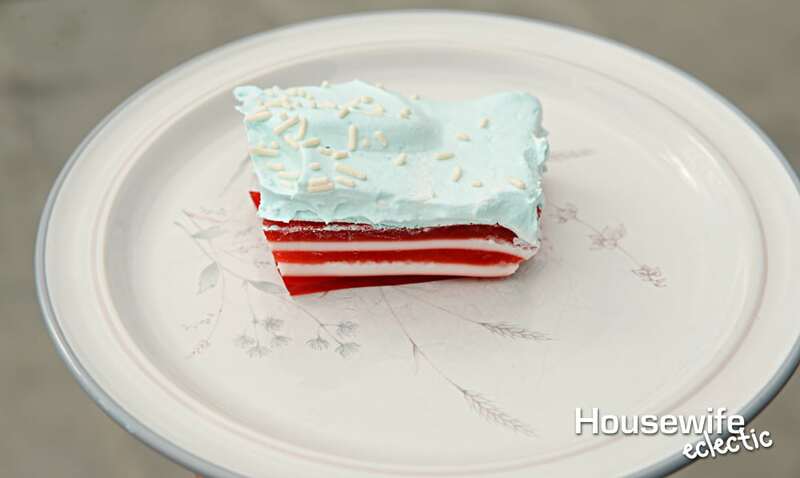 With red and white stripes, blue whipped cream and sprinkle stars, it is the American Flag in Jello form. My kids always get a big kick of out helping me make it! Dissolve your first box of red Jello in 1 cup of boiling water. Add a cup of cold water and mix. Pour the Jello into the pan and allow to set for 30 minutes. Make sure the pan is as flat as possible when you put it in the fridge so your layers don’t end up crooked. Dissolve a package of unflavored gelatin in 1 cup boiling water. Then add 1/3 of a cup of sour cream and mix until well combined. I use a whisk to get it really well mixed. After the 30 minutes have passed and the Jello in the fridge has set up, pull the pan of Jello out and pour the bowl of Jello with the sour cream in it over top the set Jello. Place back in the fridge for 30 minutes. Repeat until you have all six stripes, three red and three white. Add a couple of drops of blue food coloring to whipped cream. 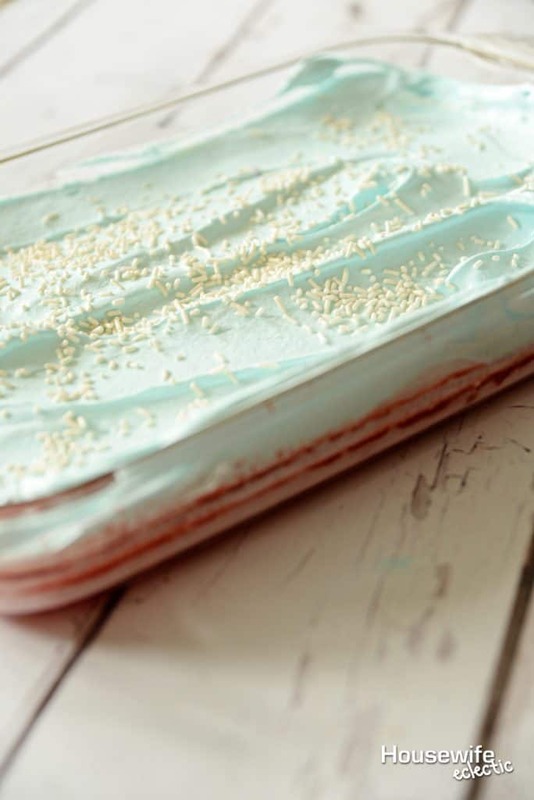 Spread the blue whipped cream over the top of the red and white stripes. Top the blue whipped cream with white sprinkles to represent the start. This is pretty darn simple to make, it does take a little bit of waiting time but it packs a lot of fun in one dish. What do you make for The 4th of July? That looks terrific! I like the idea of putting the blue in the whipped topping, I tried it in pudding once and it didn’t look as blue as it should have. What a fun recipe. I bet this is perfect even for a pot luck dinner. What a neat idea. I love Jello in the summertime. I really love how this looks. This would be a great recipe to make with my kiddo. It’s something easy that he can do and we will both enjoy the desert. Oh this looks so colourful and absolutely delicious, I really need to make myself some jelly I haven’t had any in forever. I love using whipped cream as frosting. It always looks good in photos as well as tastes so light compared to cream cheese frostings. I’m not a fan of Jello at all, but I love the pretty desserts it makes. This looks fab! That is really cute, and I’ll bet it is tasty! I love making flag cakes for the 4th. That came out so cute! I know the 4th is over, but it would be perfect for any summer party. I’m thinking Labor Day! This is so cute. I am a big fan of patriotic desserts and desserts that are themed to holidays. Oh wow, the layers really turned out well. I’ve never done that! These are such cute and patriotic dessert treats! I’m sure this tastes goods. I’ve been thinking of preparing something new for the kids. This jello would be perfect. This jello looks very enticing. I will suggest this to my colleague, this is great to serve when throwing up a party. 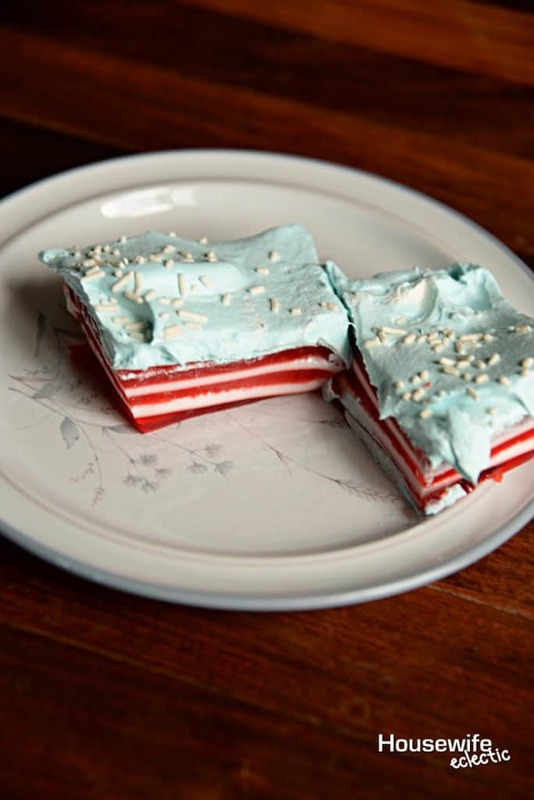 I haven’t eaten Jello in years and this red white and blue flag Jello looks delicious!! I may have to break my no-Jello streak for this!! My sister in law used to make this kind of dessert on the 4th of July. It looks delicious, what a treat! This looks like a really fun patriotic dessert! I will definitely try to make this for my girls.